The TD86 is designed for rugged industrial control applications that require compact size, superior performance, and reliability. 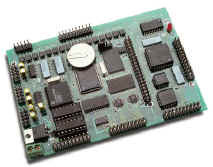 Measuring 4.8 by 3.4 by 0.5 inches, the TD86 offers a complete C/C++ programmable computer system with a 16-bit, 40 MHz CPU (186). The TD86 supports a 16-bit external data bus, 24 TTL bi-directional I/O pins, 16 channels of high-speed ADC, and 4 channels of high speed DAC; all contributing to a controller that can be used in the most demanding applications. With the wider external data bus, code executes directly out of 16-bit SRAM or 16-bit flash, which leads to greater application performance. The CPU can also access the parallel 12-bit ADC, or parallel DAC with zero wait state in a single operation. A 64 KW (128 KB) or 256 KW (512 KB) SRAM is available as options for the TD40; with the onboard battery, acquired data and application code can often be stored 2-3 years without any difficulty. A 256 KW (512 KB) Flash chip is installed by default on the TD86. The Flash chip is configured with the ACTF loader, which allows you to easily download your application code directly into non-volatile Flash memory over the serial port. 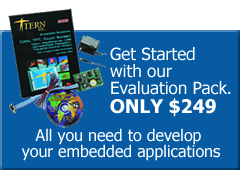 This process allows you to easily update your in-the-field-application remotely, making obsolete the act of physically replacing ROM chips or directly downloading code with the debugger. 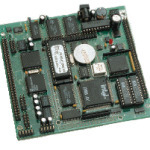 Three external 16-bit programmable high-performance counters (71054, NEC), each with its own clock input, gate input, and output are available on the TD86. These components can be clocked up to 10 MHz. Another two timers internal to the CPU can also be used to count or time external events at rates of up to 10 MHz. They can also be used to generate non-repetitive or variable-duty-cycle waveforms as PWM outputs. The Pulse Width Demodulation (PWD), a distinctive feature, can be used to measure the width of a signal in both its high and low phases. This has potential in a variety of applications, such as bar-code reading. In addition, the TD86 offers a wide range of input/output channels that makes it a good choice as the heart of any industrial control or data acquisition project. The TD86 has 16 opto-isolated digital inputs, 14 solenoid drivers, and 24 TTL I/O pins. The 16 opto-couplers (PS2701/5, NEC) can take up to 50V DC (PS2701, default) or AC (PS2705) inputs. These opto-couplers have 3 s ON time and 5 s OFF time. Five opto-inputs can also be used for external interrupts. The 14 solenoid drivers (high voltage outputs) are capable of sinking 350 mA at 50V per line, and can be used to drive solenoids or relays. Note that in contrast to the TD40, the TD86 does not use screw terminals for input/output. The TD86 provides four serial ports as part of its default configuration; two from the Am186ES CPU, and two from an on-board SCC2692. All four are configured for RS232 operation by default, but one CPU-internal serial port (SER1) can be configured for either RS485 (half-duplex) or RS422 (full-duplex) operation, and both serial ports on the SCC2692 can be configured for RS485 operation. The CPU-based serial ports are DMA-driven and can communicate at rates of up to 1.5 Mbaud in peak situations, and 115,200 in normal operation. The TD86 also supports: on-board 512-byte EEPROM for storing configuration information, a watchdog timer for automatic hardware resets in case of application errors, and a real-time clock providing information on the year, month, date, hour, minute, second, 1/64 second; the real-time clock can also be used to generate a timed interrupt signal. An optional switching regulator can be installed to reduce power consumption and heat, while accepting voltage inputs of up to 35V. It also supports power-off mode, allowing an application to reduce the TD86 to uA-level power consumption. The TD86 also supports the Memcard (MM-A), which gives it access to PCMCIA ATA Flash cards for storage capabilities of up to 1 GB. Several other versions of the TinyDrive exist. The popular TD40 is based on a 8-bit processor, but offers more solenoid drivers and high-voltage I/O than the TD86, and also offers convenient screw terminal access to I/O lines. Real time clock, battery, switching regulator.